Laser diodes have been used for many years in space applications. Their main use has been as pumps for solid-state lasers, and qualification methodologies have been developed for these applications. In recent years, however, increasingly complex scientific payloads have required precision lasers for metrology, calibration, and environmental sensing. As a result, payload engineers have developed increasingly stringent screening criteria for space qualification to ensure the reliability and performance of precision laser diodes for space applications. Because the failure of even a single component can jeopardize the success of the payload, the devices must be specified, screened, qualified and selected according to protocols determined by mission requirements. Through deliveries with its existing space customers, Photodigm has developed detailed certification procedures to certify its precision DBR lasers, third party Commercial Off-The-Shelf (COTS) lasers, or other components on a lot-specific basis for use in space missions. Spaceflight subjects the mission elements to extraordinary environmental conditions, from high g-forces at launch to extreme temperature gradients and high radiation fields. Further, the impact of component failure requires adherence to the highest standards of build quality and product performance. Screening must be performed to ensure conformance to specifications under mission operating conditions for the entire design lifetime, which may last years. Space qualification begins with the development of a component Acceptance Test Plan (ATP). The development of an effective ATP requires both device engineers and space systems engineers to work closely together to understand the both the performance limitations of the components and the operational environment of the mission. By careful procurement and screening according to the ATP, operational limits of the components can be explored, physics of failure mechanisms understood, and any appropriate de-rating applied. The goal of the ATP is to reduce the potential for component failure to an extremely low level. Only after successful completion of all testing according to the ATP can a lot of devices be certified for mission applications. The Space Level qualification process begins with the specification and selection of laser diodes that meet the optical and electrical requirements of the mission. Presumption of suitability begins with the availability of a sufficient quantity of devices from a single traceable manufacturing lot to allow destructive testing, reservation of controls, and strict quality screening to yield an appropriate number of flight units. A population will be selected for screening according to the appropriate military, NASA, ESA or other space agency performance specifications. This population will then be screened and qualified according to the ATP. A subset of the original population will be certified as flight units per the requirements defined in the ATP. A general ATP flow is shown in Figure 1. The detail of each test is proprietary to the customer. In general, however, they follow military standard specifications. Fig 1. Typical flow chart used by Photodigm in developing an ATP. 100% of the manufactured or procured components are screened per the ATP documents. This typically includes component serialization and burn-in, but may include other tests such as Destructive Physical Analysis (DPA), vibration, Particle Impact Noise Detection Testing (PIND) and mechanical tests. Qualification testing will begin after 100% completion of the screening tests. Before beginning qualification testing, a subset of the population will be randomly selected and reserved as a pool of potential flight units. Any test required by the ATP that is already performed by the procurement specification (for example, mil-standard) need not be repeated. 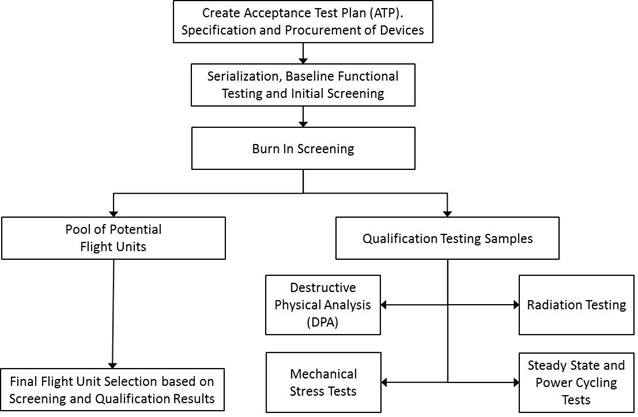 All devices used in qualification testing are considered unsuitable for use as flight units. Typical qualification testing includes Physical Analysis and Stress Testing, Life Testing, and Radiation Testing. To ensure device compliance in a vacuum environment, many space programs specify the ASTM-E595 procedure for thermal vacuum exposure and analysis of materials. A destructive physical analysis (DPA) is performed in which all materials can be identified as well as the location of the material in the package. For mechanical stress qualification, temperature cycling, vibration and PIND tests are common requirements. Many space programs specify the for steady-state operation life intermittent operation life tests. A typical test plan includes long-term steady state operations of at least 1,000 hours and high count on-off operation of at least 6,000 cycles on samples of indicative quantity of a candidate lot. Space missions subject the payload to significant radiation fields, so space qualification requires that the laser diodes be tested to assess their ability to perform for the flight duration and specific orbit degradation. Both Total Ionizing Dose (TID) and Displacement Damage (DD) are well-known hazardous exposure effects that may cause laser diodes to suffer performance degradation. TID is typically simulated by gamma ray radiation test and DD is typically simulated by neutron or proton radiation test. The actual radiation fluxes encountered vary widely depending on the mission orbit, solar cycles and spacecraft shielding. Earth orbits are described as Low Earth Orbit (LEO, at an altitude of 100 to 1200 miles), Geosynchronous Orbit (GSO, altitude of 22,000 miles), and Medium Earth Orbit (MEO, between LEO and GSO). This is shown in Fig. 2. Each orbit has its typical background radiation environment. Background radiation for LEO missions typically range from 5 to 10 krads. Most of this dose is accumulated during passes through the South Atlantic Anomaly (SAA), a weak spot in the earth’s magnetic field, which leads to an increased level of radiation. 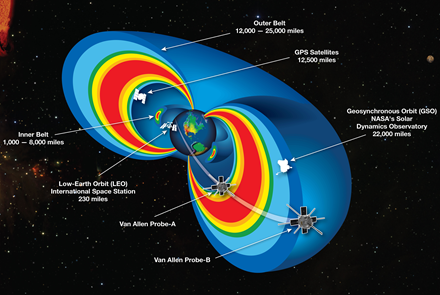 The MEO passes through the Van Allen Belts, and total dose exposures typically range from 10 to 100 krads. For GSO the majority of the radiation exposure is due to cosmic rays and is typically around 50 krads. Because of these widely varying environments, the ATP radiation test protocols will be mission dependent. Table 1 describes each earth orbit. Fig. 2. The radiation environment encountered by satellites is established by the interaction of charged particles with the earth’s magnetic field. (Image credit: NASA). Table 1. Description of each earth orbit. Many detailed studies have examined the radiation degradation mechanisms in laser diodes. Radiation damage generally increases the optical losses and decreases the electrical efficiency in laser diodes. The test will examine radiation-induced changes in the lasing threshold current, slope efficiency, operating current at constant power, optical power, and forward voltage The ATP will typically require that these parameters change by less than 10% in the test in order to pass the test. If the devices pass all screening and qualification tests, all of the potential flight units are flight eligible. The customer, after reviewing all data, will select devices for flight from the pool. 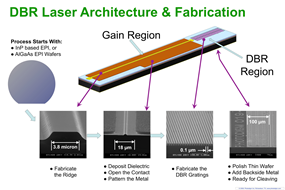 Photodigm DBR lasers are fabricated from the GaAs materials system, with either Al or In depending on the design wavelength. While this materials system presents numerous processing challenges, Photodigm’s proprietary, low loss epi designs and careful fabrication processes have resulted in the world’s highest performance single frequency laser diodes in the 740-1100 nm wavelength range. Figure 3 shows the architecture of the Photodigm DBR laser. Figure 3. Schematic of the critical elements of the Photodigm DBR laser. Photodigm final manufacturing processes and packaging are held to high standards of build quality, critical for high performance and reliability in mobile applications. Terrestrial robustness results in devices suitable for space qualification. 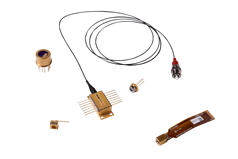 Several of Photodigm’s high powers, single frequency DBR laser diode products have been qualified for specific space programs for both LEO and MEO using the ATP methodology described in Fig. 1. They are available in various packages, from butterfly packages with single mode fiber output, to free space outputs, as shown in Figure 4. Figure 4. Available package options for Photodigm DBR lasers, ranging from single mode fiber output to free space designs. Photodigm’s products undergo rigorous screening and testing to ensure reliable performance. Infant mortality failures can be eliminated during rigorous burn-in. Device failures are dictated by random failure originated from bulk defects in the epi that propagate through the active region. Long term testing after burn in reveals degradation consistent with >50,000 hours lifetime at specified operating conditions. 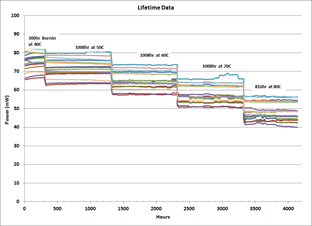 Photodigm routinely investigates the performance of standard products lots using accelerated aging test as shown in Fig 4 for 765 nm devices. The data presented in Fig. 4 shows multi-step lifetime aging at increasing temperature steps to determine the temperature acceleration coefficients for lifetime estimation. The coefficients for drive current accelerated lifetimes are performed in a separate study based on the specific materials and laser diode architecture. The data shown demonstrate that this AlGaAs-based DBR laser diode exhibits robust reliability with an estimated lifetime of over 50,000 hours. Figure 4. Multistep lifetime aging test for Photodigm 765 nm laser diodes. The GaAs materials system has proven itself to be highly robust in radiation exposure at typical earth orbits, as can be seen in Table 2. Table 2. Results of testing of Photodigm 768 nm DBR lasers in typical free space packages in a simulated MEO environment. As the demand for qualified commercial optoelectronic components and technologies for space missions grows, Photodigm has responded by manufacturing a range of space-qualified DBR laser products that have enabled various space flight laser applications. In order to qualify flight units with high reliability and low cost, our knowledge and experience of manufacturing materials, procedures, and device failure modes has proven crucial to the design of comprehensive ATPs for making feasibility decisions as well as early risk mitigation. Based on this expertise, Photodigm has also leveraged their space qualification capability by developing ATPs to include components from other commercial laser diode and sensor vendors and manufacturers.